Freshly Made Paranthas 7 days a week on the corner of Bowery and Great Jones Street in Manhattan's East Village and on the weekends at Smorgasburg in Williamsburg and Prospect Park in Brooklyn. In true desi style there are veg and non-veg choices and vegan ones too! 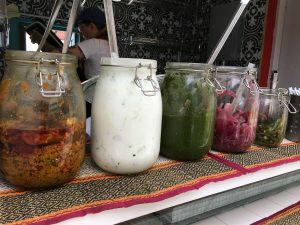 Our Street Food Stand is open 7 days a week and open LATE! It's located at 348 Bowery in the NoHo district of Manhattan's East Village. A perfect place to get a quick parantha fix. Su-W 11AM-11PM, Th-Sa 11AM-12AM. 10PM onwards we offer discounted "Extreme Vetting" plates. 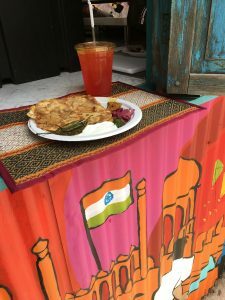 Parantha Alley finally opened its brick and mortar location at 348 Bowery on May 1, 2017!! 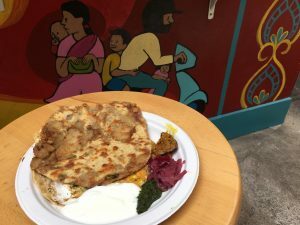 Parantha Alley was invited as a 2017 summer season participant at Bryant Park's Summer Friday Picnics!! Parantha Alley was featured in "Must Eat NYC" Out in Bookstores in 2016!! 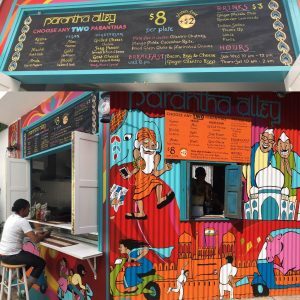 Parantha Alley was chosen as a participant in Central Park's Summer Stage in July 2015!! Parantha Alley was chosen as a 2014 participant at Grub Street in the Lower East Side in October 2014!! Parantha Alley was chosen to be featured in "Food Truck Road Trip: A Cook Book" out at bookstores November 2014!! Parantha Alley will be donating food at the Brooklyn Free School's 6th Annual Gala on May 15, 2014!! Parantha Alley will be at the Circle Theatre of New York's Brooklyn 'LIVE ART' Market at the Brooklyn Lyceum March 1, 2014!! Parantha Alley will be at the Harlem Food Festival in October 2013!! 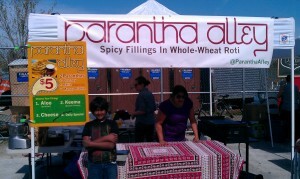 Parantha Alley was chosen as a 2012 Vendy Award Finalist! !